Singtel subsidiary Amobee, a digital marketing technology company, has expanded its management team in the US with two global hires. 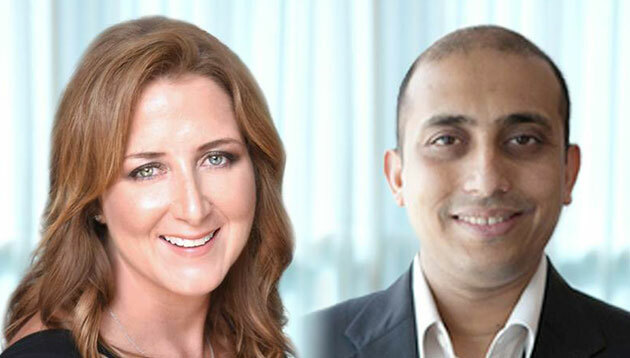 Katie Ford (pictured left) as been appointed chief client officer and Shouvick Mukherjee (pictured right) as chief technology officer. This follows the acquisition of global technology platform Turn for an enterprise value of US$310 million earlier this year. Ford is charged with the introduction and adoption of the Amobee Marketing Platform with brand and agency clients. She was most recently president, managing director at Spark Foundry (formerly known as MediaVest | Spark) in Chicago for over a year, and was president, managing director at MediaVest New York for two years. At MediaVest, she ran the integrated business unit for Coca-Cola North America and oversaw all connections planning, investment/activation, data and analytics, performance marketing and programmatic. Prior to joining MediaVest, Ford worked at Starcom for over 18 years, helming roles such as executive VP, managing director; senior VP, group director; senior VP, global account director; and VP, client director. She also worked at Leo Burnett as a buyer/planner. “I’m thrilled to join Amobee at a time of enormous trajectory for the company. I’ve spent my career working with phenomenal agencies and brands and I understand intimately the challenges marketers face around the convergence of data, technology and creativity, which is where Amobee’s platform excels,” Ford said. In his role as chief technology officer, Mukherjee will be responsible for Amobee’s data science, engineering and technology teams. Prior to joining Amobee, Mukherjee was the VP of product and engineering at Walmart eCommerce, where he made use of big data and artificial intelligence to build innovative user experience and marketing products for the company. His team was in charge of aspects such as personalisation, advertising, omni-channel digital relationship, customer loyalty and customer acquisition. Mukherjee also connected online and offline retail data, as well as leveraged on and off network data to better understand Walmart’s customers and improve their retail experience. Before moving on to Walmart, Mukherjee spent 20 years with Yahoo, with his last role being VP of engineering for consumer platforms in the US in 2015. Among the platforms he was responsible for include content, video, geo location and social. He was also the VP and CEO of Yahoo India Research and Development (R&D) for more than four years, tasked with creating a remote development strategy for the company and driving Yahoo India R&D to become the hub for production and technology innovation. “Amobee has proven that it is without rival in navigating the rapidly evolving digital marketing space, and I look forward to working with the team to continue to advance the company’s programmatic and data management capabilities following the integration of Turn,” Mukherjee said. “Ford and Mukherjee are respected industry leaders and a perfect addition to the world-class team we have assembled. They share in our excitement to propel Amobee through its next stage of growth, as we continue to enhance the value we provide marketers through people, products and technology,” Kim Perell, Amobee’s CEO, said. This is for its network development and business development divisions. .. Marketers who fail to comply with the guidelines will risk the withholding of advertising space or time by media owners, as well a..